Despite multiple commitments and increased international attention, efforts to save the world’s most endangered marine mammal are proving woefully inadequate – without urgent coordinated action from Mexico, the US and China, the extinction of the vaquita seems inevitable. The vaquita is found only in the northern Gulf of California in Mexico. In the past five years, its population declined by 90 per cent as a result of entanglement in gillnets, many set to illegally catch the totoaba, a large and critically endangered fish that is also endemic to the Gulf of California. EIA has carried out a series of investigations into the totoaba trade since 2015. Our September 2016 report Collateral Damage warned that the vaquita, the world’s smallest and most endangered cetacean, was doomed to extinction if substantial targeted and coordinated enforcement efforts were not immediately put in place to eliminate threats to its survival. A report by the International Committee for the Recovery of the Vaquita (CIRVA) released yesterday (February 2) reveals that, despite significant efforts of the Mexican Government in coordination with Sea Shepherd Conservation Society, illegal fishing still continues. The vaquita stands today on the very edge of extinction: almost half those remaining were lost between 2015 and 2016, and the species is thought to number only about 30 individuals. The swim bladder of the totoaba is highly sought after in China for use in traditional medicine and in 2016 EIA investigations revealed an ongoing trade in Guangdong province, China, despite such trade being illegal. Illegal fishing of the totoaba has typically been concentrated in the winter and recent weeks have seen a spate of seizures of totoaba swim bladders in Mexico. On December 21, 2016, three totoaba swim bladders were seized from a car on the road between San Felipe and Puertecitos, two towns on the Gulf of California coast. Two people were arrested after admitting they were driving from Puertecitos to sell the swim bladders in Mexicali, a well-known smuggling hub on the US border. On December 28, police seized 8.5kg of totoaba from the premises of a logistics company. Then on December 29, another totoaba swim bladder was seized, again from a car on the San Felipe-Puertecitos road. The New Year has provided no respite, as 12kg of fresh, unprocessed totoaba bladder were seized on January 12, on the same road. A single totoaba bladder was seized on January 14 and on January 19, 14 were seized from an abandoned vehicle on the road to Mexicali. In comparison, no totoaba seizures, arrests or prosecutions have occurred in mainland China, the main market for totoaba. In December 2016, China held an enforcement training workshop which brought together agencies from mainland China, Hong Kong, Mexico and the US. Last month, China’s Fisheries Bureau, Market Regulation and Administration Office and CITES Management Authority publicly launched a month-long market inspection and education campaign in Guangzhou, targeted at illegal trade and consumption of totoaba. While these efforts are very welcome, China has not gone far enough to effectively tackle illegal trade in totoaba. Intelligence-led operations, using information supplied by EIA and others, are required to track down the key players in these organised criminal operations. Arrests, prosecutions and convictions carrying sentences strong enough to deter repeat offenders are needed to send a strong message that no trade in totoaba will be tolerated. Enforcement operations must target all fish maw markets; reported market inspections to date have been limited to Guangzhou, despite clear evidence that the bulk of the totoaba trade is based in Shantou. China, together with Mexico and the US, a key transit country, need to collaborate urgently to investigate and crack down on smuggling routes between the Gulf of California and China. The need for international collaboration was recognised at the CITES Conference of the Parties meeting in September 2016 where a decision was passed requiring range, transit or consumer states to conduct awareness-raising and demand reduction campaigns, and increase enforcement efforts to address the poaching and trade in totoaba. Ultimately, the fate of the vaquita lies with Mexico – and political will from Mexico is clearly lacking. In July 2016, the White House announced the outcome of the US/Mexico bilateral meeting which, according to the US, agreed that “Mexico will make permanent a ban on the use of gillnets in all fisheries throughout the range of the vaquita in the upper Gulf of California.” Mexico is yet to announce such a ban, leading to great concern over what happens when the current two-year ban runs out in April this year. At the same time, Mexico’s fishing authorities have been clear that they intend to continue to allow the corvina fishery, despite the fact that it is used as a cover for illegal totoaba fishing. While the work of those involved in seizures and net-recovery is highly commendable, the lack of uniform effort across the various responsible Mexican agencies means that the country’s overall efforts to save the vaquita are woefully inadequate, with tragic consequences. So precarious is the plight of the vaquita that plans are now underway to capture surviving animals and hold them in closely guarded ocean enclosures – a highly risky, last-ditch attempt to save the species, especially given that no live vaquita has ever been successfully captured let alone bred in captivity. It is critical that the Mexican Government steps up efforts to impose and enforce a total ban on all fishing within the range of the vaquita, along with a ban on the sale and possession of all gillnets on land or at sea in the northern Gulf of California. This is the only way to provide the vaquita with any long-term chance of survival. Even if the planned capture is successful, the vaquita will need a safe and healthy ecosystem to return to. Moreover, the totoaba is itself a critically endangered species in urgent need of protection; the continued use and abandonment of gillnets in the Gulf threatens their continued existence and harms a range of other marine species through bycatch, including dolphins and sea turtles. As highlighted in Collateral Damage, totoaba poaching can only be stopped with the collaboration of other countries, particularly the main consumer market of China. Without eliminating the market for totoaba swim bladder, or ‘maw’ as it is known in its processed state, the high prices it commands will encourage continued poaching. EIA urges China to significantly strengthen its enforcement efforts, including engagement with authorities in Mexico and the US. The recent announcement of the closure of domestic ivory markets has demonstrated that the political will exists in China to take the action needed to save a species threatened by trade – we encourage China to show the same leadership to end the illegal trade in totoaba. 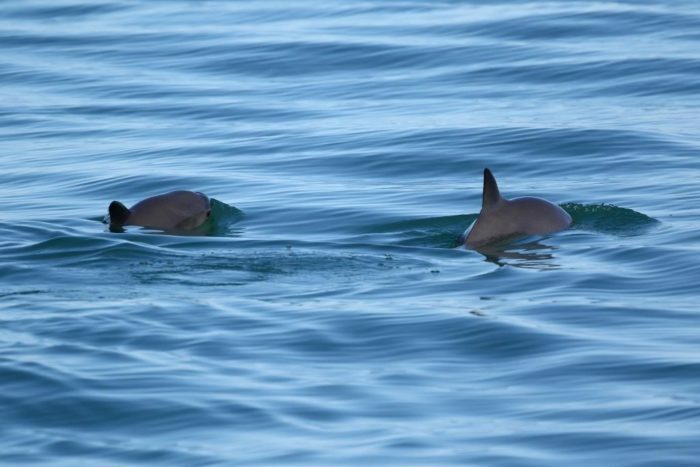 This is the very last chance we have to save the vaquita. To lose it forever would be a sad indictment of the global community and a terrible legacy to leave future generations. A pesar de los múltiples compromisos y la creciente atención internacional, los esfuerzos por salvar al mamífero marino más amenazado del mundo están resultando lamentablemente inadecuados. Sin una acción coordinada urgente de México, Estados Unidos y China, la extinción de la vaquita parece inevitable. La vaquita se encuentra solamente en el norte del Golfo de California en México. En los últimos cinco años, la población de la vaquita ha disminuido en un 90 por ciento como resultado del enredo en las redes de enmalle, usadas para capturar ilegalmente la totoaba, un pez grande y críticamente amenazado que también es endémico del Golfo de California. EIA ha llevado a cabo una serie de investigaciones sobre el comercio de totoaba desde 2015. Nuestro informe de septiembre de 2016, Daño Colateral, advirtió que la vaquita, el cetáceo más pequeño y más amenazado del mundo, estaba condenada a la extinción si no se implementaban inmediatamente medidas enfocadas y coordinadas para eliminar las amenazas a su supervivencia. Un informe del Comité Internacional para la Recuperación de la Vaquita (CIRVA) publicado el 2 de febrero de 2017 reveló que la pesca ilegal continúa, a pesar de los grandes esfuerzos del gobierno mexicano en coordinación con la Sociedad de Conservación Pastor del Mar. 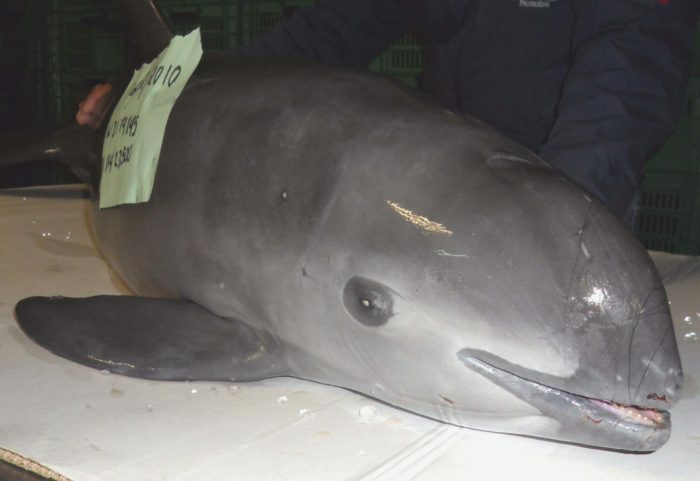 La vaquita se encuentra hoy al borde de la extinción: casi la mitad de su población se perdió entre 2015 y 2016, y se estima que la especie sólo cuenta con unos 30 ejemplares. La vejiga natatoria de la totoaba es muy codiciada en China para su uso en medicina tradicional, y en 2016 las investigaciones de EIA revelaron su comercio en la provincia de Guangdong, China, a pesar de ser ilegal. La pesca ilegal de la totoaba transcurre típicamente en invierno y las semanas recientes han visto una avalancha de incautaciones de las vejigas natatorias de totoaba en México. El 21 de diciembre de 2016, tres vejigas natatorias de totoaba fueron incautadas de un automóvil en la carretera entre San Felipe y Puertecitos, dos ciudades en la costa del Golfo de California. Dos personas fueron arrestadas, tras admitir que estaban manejando desde Puertecitos para vender las vejigas natatorias en Mexicali, un conocido centro de contrabando en la frontera de Estados Unidos. El 28 de diciembre, la policía incautó 8.5kg de totoaba de las instalaciones de una empresa de logística. El 29 de diciembre, se incautó otra vejiga natatoria de totoaba, nuevamente desde un automóvil en la carretera San Felipe-Puertecitos. El Año Nuevo no ha dado descanso, ya que 12 kilos de vejiga fresca, sin procesar, fueron incautados el 12 de enero, en la carretera San Felipe-Puertecitos. Se incautó una única vejiga de totoaba el 14 de enero y luego, el 19 de enero, se confiscaron 14 vejigas natatorias de un vehículo abandonado en la carretera de San Felipe a Mexicali. En comparación, no ha ocurrido ninguna incautación de totoaba, arresto o enjuiciamiento en China continental, el principal mercado de totoaba. En diciembre de 2016, China organizó un taller de capacitación sobre la aplicación de la ley que reunió a organismos de China continental, Hong Kong, México y Estados Unidos. El mes pasado, la Oficina de Pesca de China, la Oficina de Regulación y Administración del Mercado y la Autoridad Administrativa de la CITES lanzaron públicamente una campaña de inspección y educación de un mes de duración en Guangzhou, dirigida al comercio ilegal y al consumo de totoaba. Si bien estos esfuerzos son bienvenidos, China aún no ha ido lo suficientemente lejos para combatir eficazmente el comercio ilegal de totoaba. Las operaciones dirigidas por las autoridades, utilizando la información proporcionada por EIA y otros, buscan localizar a los actores claves en estas operaciones criminales organizadas. Las detenciones, los enjuiciamientos y las condenas que conllevan penas suficientemente fuertes para disuadir delitos repetidos son necesarias para enviar un fuerte mensaje de que no se tolerará ningún comercio en totoaba. La imposición de medidas debe dirigirse a todos los mercados de vejigas natatorias de pescado: las inspecciones hasta la fecha se han limitado a Guangzhou, a pesar de evidencias claras de que la mayor parte del comercio de totoaba se basa en Shantou. China, junto con México y Estados Unidos, un importante país de tránsito, necesitan colaborar con urgencia para investigar y combatir las rutas de contrabando entre el Golfo de California y China. En la Conferencia de las Partes de la CITES celebrada en septiembre de 2016, se reconoció la necesidad de colaboración internacional al aprobarse una decisión que requería que los países consumidores, de transito o habitados por la especie realizaran campañas de sensibilización y reducción de la demanda y aumentaran los esfuerzos para hacer frente a la caza furtiva y al comercio de totoaba. En última instancia, la suerte de la vaquita recae en México, y la política mexicana claramente carece de volutnad. En julio de 2016, la Casa Blanca de Estados Unidos anunció el resultado de la reunión bilateral entre Estados Unidos y México que, según los Estados Unidos, acordó que “México prohibirá permanentemente el uso de redes de enmalle en todas las pesquerías a lo largo de la zona habitada por la vaquita en el Alto Golfo de California”. México aún no ha anunciado tal prohibición, lo que genera gran preocupación por lo que ocurrirá al vencer la actual prohibición de dos años en abril de 2017. Al mismo tiempo, las autoridades pesqueras de México han demostrado claramente su intención de seguir permitiendo la pesca de curvina, a pesar de que se sabe que se utiliza como una cubierta para la pesca ilegal de totoaba. Aun que el trabajo de aquellos involucrados en las incautaciones y la recuperación neta es altamente admirable, la falta de esfuerzos uniformes entre las diversas agencias mexicanas responsables significa que los esfuerzos generales de México para salvar la vaquita son lamentablemente inadecuados, trayendo graves consecuencias. La situación de la vaquita es tan precaria que actualmente hay planes en marcha para capturar a los animales supervivientes y mantenerlos altamente vigilados en zonas cercadas en el océano – un intento muy arriesgado de última hora para salvar a la especie, especialmente dado que no se ha capturado con éxito ninguna vaquita con vida, y menos aún criada en cautividad. Es extremadamente necesario que el gobierno mexicano aumente sus esfuerzos para imponer y hacer cumplir una prohibición total de toda la pesca dentro del rango de la vaquita, junto con la prohibición de la venta y posesión de todas las redes de enmalle en tierra o en el mar en el norte del Golfo de California. Esta es la única manera de proporcionar a la vaquita cualquier posibilidad de supervivencia a largo plazo. Incluso si la captura planeada tiene éxito, la vaquita necesitará un ecosistema seguro y saludable al que volver. Por otra parte, la totoaba es en sí misma una especie en peligro de extinción en necesidad urgente de protección. El uso continuo y el abandono de las redes de enmalle en el Golfo amenazan su supervivencia y perjudican a una variedad de otras especies marinas a través de la captura accidental, incluidos los delfines y las tortugas marinas. Como se destaca en Daños Colaterales, la caza furtiva de totoaba sólo puede ser detenida con la colaboración de otros países, en particular China, el principal mercado consumidor. Sin eliminar el mercado de la vejiga natatoria de totoaba, también conocida como ‘buche’, sus altos precios fomentarán la caza furtiva. EIA insta a China a fortalecer significativamente sus esfuerzos de cumplimiento, incluyendo el compromiso con las autoridades de México y Estados Unidos. El reciente anuncio del cierre de los mercados nacionales de marfil ha demostrado que en China existe la voluntad política de tomar las medidas necesarias para salvar a una especie amenazada por el comercio. Animamos a China a mostrar el mismo liderazgo para poner fin al comercio ilegal de totoaba. Esta es la última oportunidad que tenemos de salvar a la vaquita. Perderla para siempre sería una declaración triste de la comunidad global, y un legado terrible para dejar a futuras generaciones.